By Allan Fox: Andre Ward says he thinks Sergey Kovalev is going to lose tonight when he faces WBO light heavyweight champion Eleider Alvarez in a rematch. Ward expects former IBF/WBA/WBO light heavyweight champion Kovalev (32-3-1, 28 KOs) not to have taken ownership of his past defeat to Alvarez and his two losses to himself, and he’s predicting that he’s going to do worse than he did in his previous 7th round knockout loss to Eleider (24-0, 12 KOs) last year in August. Kovalev will be meeting World Boxing Organization 175 lb champion Alvarez on ESPN+ tonight at 12 a.m. at The Ford Center at The Star, in Frisco, Texas. Ward (32-0, 16 KOs) defeated Kovalev twice, once in November 2016 by a controversial 12 round unanimous decision, and a second time in June 2017, a fight which also ended in controversy following three punches from Andre that all appeared to be low. “I just don’t think Kovalev, similar to our two fights, takes responsibility and ownership of his lack of performance, and the defeat itself and the outside the ring stuff, and all the stuff that led to our two fights and how those turned out, and his fight with Alvarez,” Ward said to Fighthype. “So that tells me that he’s either going to be the same, and looking at the way he got knocked out, he won’t come in the same. So that tells me that he’ll either be a bit worse than he was the first time around with Alvarez. It doesn’t mean he won’t be serviceable. It doesn’t mean he won’t be good enough to get the win. He can win. I just don’t think he will, but this is boxing. He can go out and clip Alvarez, and we could have a totally different discussion,” Ward said. Ward is leaving himself an out with his prediction. By Ward saying that there’s a chance that Kovalev could still win, it means he won’t as much criticism for having a wrong prediction. It’s clear of Ward, but makes him look wishy-washy, because he’s not making a prediction and sticking by his guns. Ward makes it pretty clear that he thinks Kovalev, 35, will lose the fight. That’s the thing that stands out more so than him saying that Kovalev can still win if he “clips Alvarez.” Ward thinks that Kovalev will be stuck having to fight Alvarez a third time if he wins tonight. That might be, but it depends on what money fights are out there for him. If the World Boxing Organization tries to force Kovalev to fight Alvarez a third time by ordering the fight, he can always vacate the belt, and go after a fight against Dmitry Bivol, Artur Beterbiev or Oleksander Gvozdyk. Having the WBO belt won’t validate Kovalev as a fighter at this point in his career. He’s popular enough for him to fight the other champions without the WBO belt if need be and still attract a lot of attention from the boxing fans. 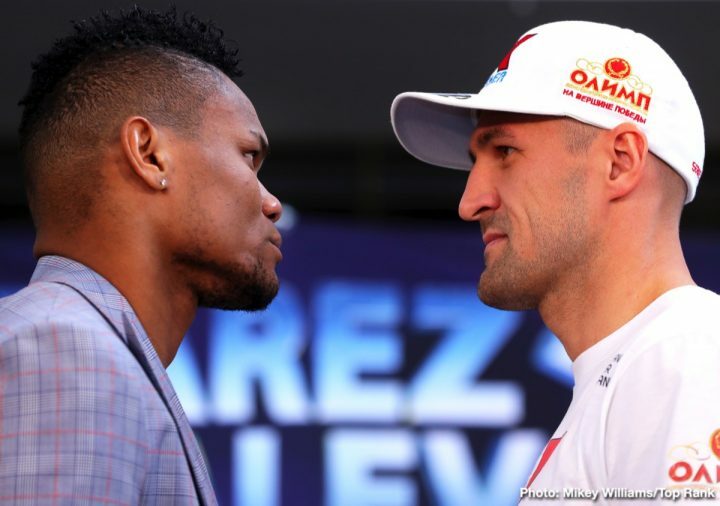 The WBO likely won’t stand in the way of a unification if Kovalev beats Alvarez, and then goes after a unification fight against WBC champ Gvozdyk, WBA belt holder Dmitry Bivol or IBF champion Beterbiev. “The thing about Kovalev is the only way for him to prove that he’s back, to cement that he’s back, he’s got to win two fights, because if he wins tonight, guess what they’re going to be doing next?” Ward said. “It’s going to be a rubber match. Even when we fought, that was one of my motivations in training camp, I did’t want to fight this dude a third time. If he beats me somehow, some way, I didn’t want to have a rubber match. So he’s going to have to do that if he wins tonight. It’s almost like two for one,” Ward said. It doesn’t matter if there’s a third or even a fourth fight between Kovalev and Alvarez. The boxing public will tune in to see the two of them face each other. There will be even more interest in a Kovalev vs. Alvarez third fight if Sergey wins tonight. It’s all good. There’s nothing wrong with Kovalev fighting Alvarez a third time. He’ll make good money, and he’ll keep him active. If Kovalev wins that fight, he can always go after the other champions in the light heavyweight division in a unification match. That’s what Kovalev. He wants to unify the 175 lb division. “I don’t think so,” Ward said when asked if Kovalev will start calling him out tonight if he beats Alvarez. “He may do it to save face. He may do it to appear like he wants it, but come on; the fight was a long time ago. He hasn’t really made a big push for that. Why now? Why not do it in the last year and a half? I don’t see that. He’s not only got Alvarez. The light heavyweight division is stacked right now. I think he knows he can’t beat me. Anything can happen. I can get clipped. As a fighter, he knows he’s got my number. I think he gets it,” Ward said. The way the boxing public sees the Ward vs. Kovalev rivalry is the two are 1-1, with Sergey having won the first fight, and Andre winning the second. Even the second fight was controversial due to the low blows from Ward in the 8th round that led to referee Tony Weeks stopping the fight. Ward didn’t prove that he was a better fighter than Kovalev. Both of their fights were tainted due to the controversy surrounding the judging from fight #1, and the non-call by the referee Weeks for what appeared to be three low blows from Ward in fight #2. If anything, neither guy proved that they were better. You can argue that the two fights were incomplete due to the officials arguably tainting the outcomes of both fights. It was a lousy way for Ward to end his boxing career with his second win over Kovalev because the way it ended. Ward is right about Kovalev not being interested in fighting him, but for different reasons. Kovalev doesn’t appear to believe that Ward is a better fighter than him. It appears that Kovalev sees Ward as the more popular guy, and that could make it impossible for him to beat him short of knocking him out, which isn’t going to be easy to do. Ward does a lot of holding and mauling, and it’s hard for Kovalev to throw punches when he’s dealing with a wrestler. It’s a better for Kovalev to fight other guys that have traditional fighting styles, that do less holding, wrestling and less rough house tactics.